TRANSPORT MINISTER SHANE Ross has appealed to drivers to be more aware of cyclists this bank holiday weekend. To date in 2018, six cyclists have been killed on Irish roads, compared to four in the same period last year. Added to this, there was a 50% increase in cyclists’ deaths in 2017 against 2016. Today Ross and members of the gardaí and Road Safety Authority will appeal to drivers to leave a safe distance when overtaking cyclists and renew their appeal to all road users to act responsibly when travelling on the roads. The RSA says it wants to educate drivers on sharing the roads safely with cyclists and highlight a motorist’s responsibility to cyclists as vulnerable road users. 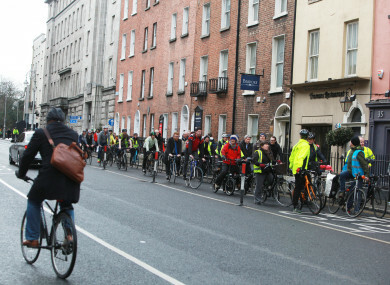 Last week, around 50 cyclists staged a lie-down protest outside of Leinster House to protest the number of cyclists killed on Irish roads. Earlier this year, Ross announced legislation requiring drivers to allow a minimum passing distance for cyclists. The law will require drivers to allow one metre when passing cyclists on roads with a speed limit under 50 km/h and 1.5 metre on roads with a limit of 50km/h or above. Ross said that the law was with the Attorney General. Assistant Garda Commissioner David Sheahan of the Garda National Roads Policing Unit said: “We are calling on drivers to heed their speed, slow down and keep their eyes on the road. It is important to be conscious of cyclists at junctions, particularly when turning left, to check the various driver blind spots and allow plenty of space when overtaking a cyclist. Email “Motorists urged to be more aware of cyclists this bank holiday weekend”. Feedback on “Motorists urged to be more aware of cyclists this bank holiday weekend”.